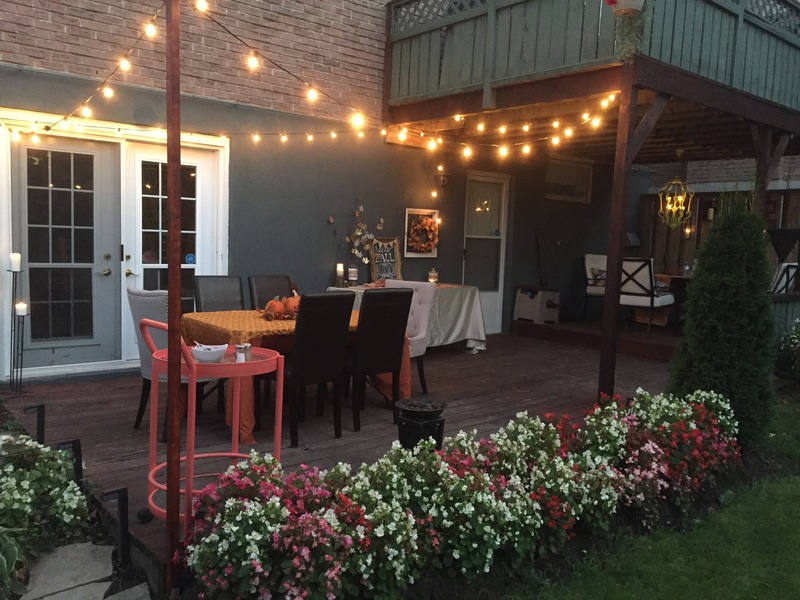 With the fall temperatures being so mild this year, I was completely stoked to finally be able to host an outdoor Thanksgiving for friends and family. With the help of Porch.com and ATG Stores.com, this was definitely one of my more memorable family gatherings, and I’m so excited to show you all. Here is my Thanksgiving tablescape. I went with very traditional fall tones in yellow, brown, gold and orange; all the tones of fallen leaves. For my centerpiece, I simply added three pumpkins, and wrapped them with a fall vine to add some texture and interest. 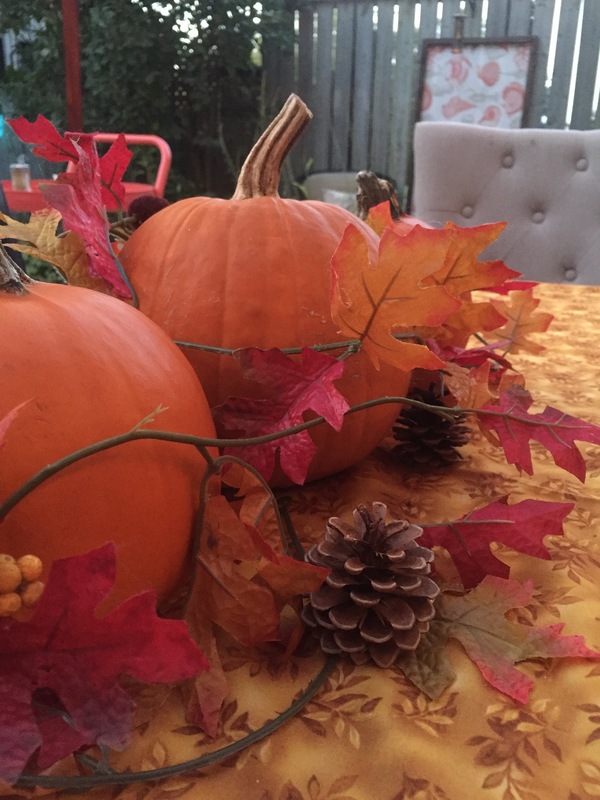 Some pinecones were also scattered around the pumpkins to help bring in that fall feeling. Our dining chairs were hauled outside so that we could all sit comfortably outdoors while gobbling down our turkey. It was honestly so wonderful to be able to dine amongst all the greenery and flowers still in full bloom. 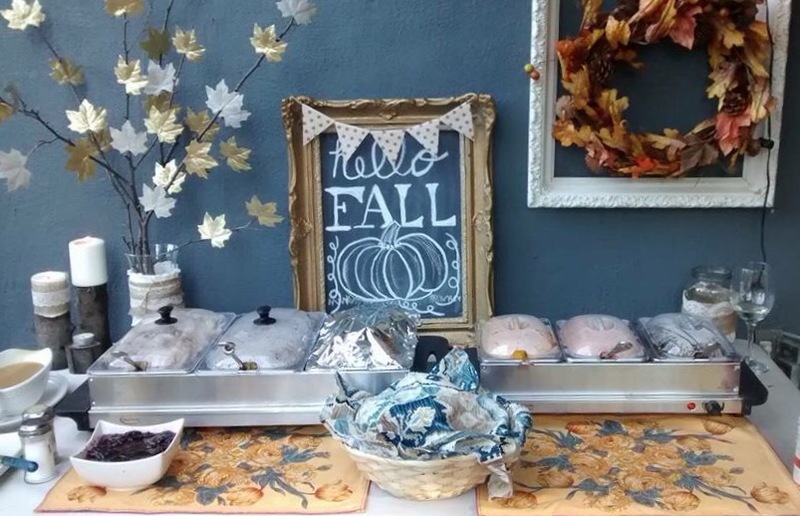 We served our dinner buffet style, which worked out beautifully. What made this occasion so special was the wonderful ambient lighting that I picked out from ATG Stores.com. Do you remember this post from way back in June? I entered the Maker Mood Board Contest, hosted by Porch.com and ATG Stores, where I had to design and create a mood board inspired by a picture from the porch.com site. Click here to see my contest entry blog post. I was so excited to find out that I won second place!!!!! And second place ain’t bad at all, right? Congrats to Brent and Courtney from Gray House Studio who won first place with their amazing mood board, and to Bre from brepurposed for her incredible and creative third place mood board. I’m truly honored to be in such talented company. As part of the second prize, I was able to spend $100 on anything I wanted from the ATG stores website. 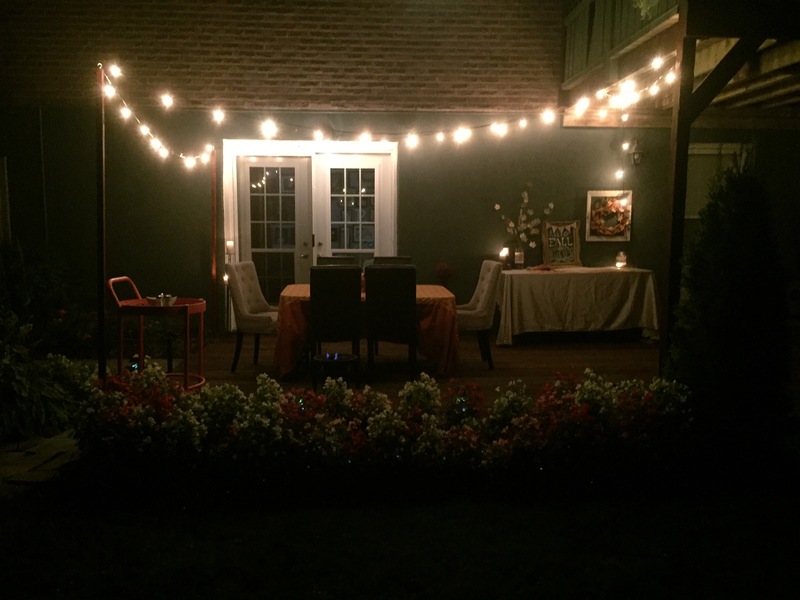 Since I’ve always lusted after ambient outdoor lighting, I chose these amazing porch lights. 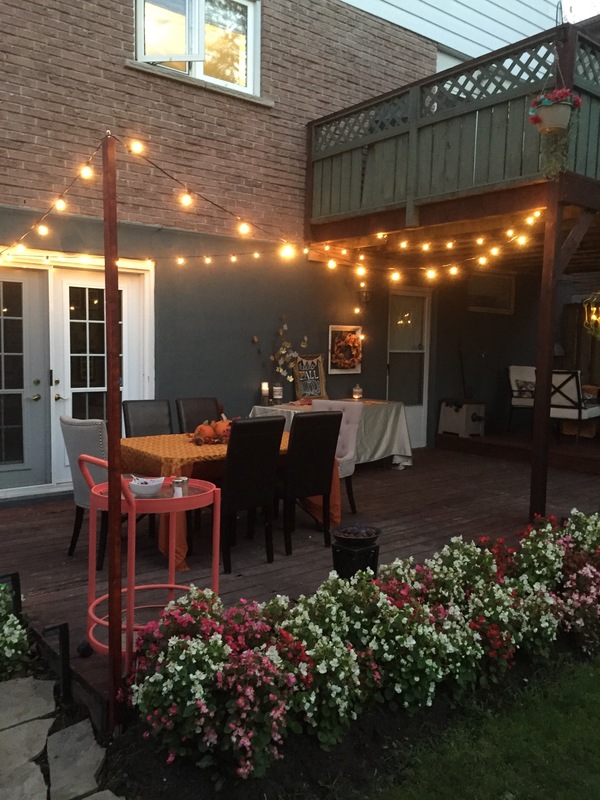 We installed these 2×2 posts with hooks on top, on the far side of our deck to support the lights, so that they could easily drape across the dining area. 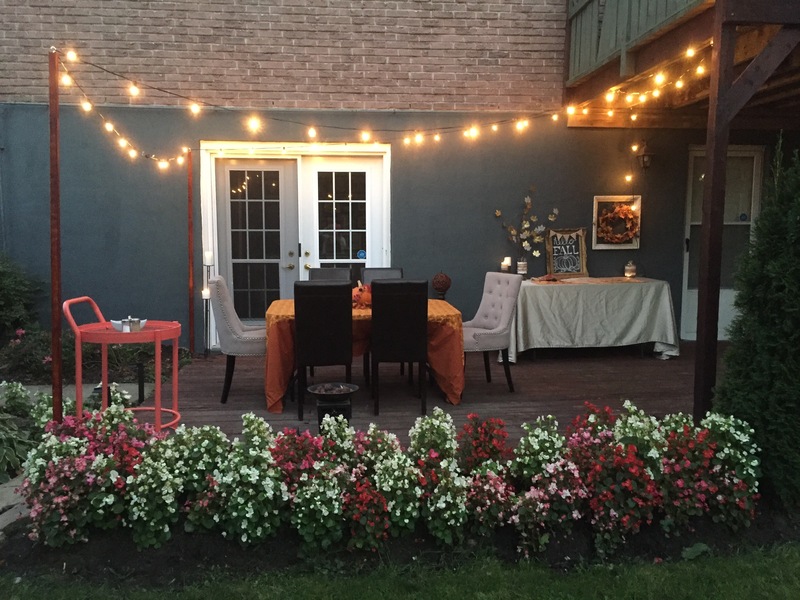 As the sun went down, the lights lit up the dining area beautifully. 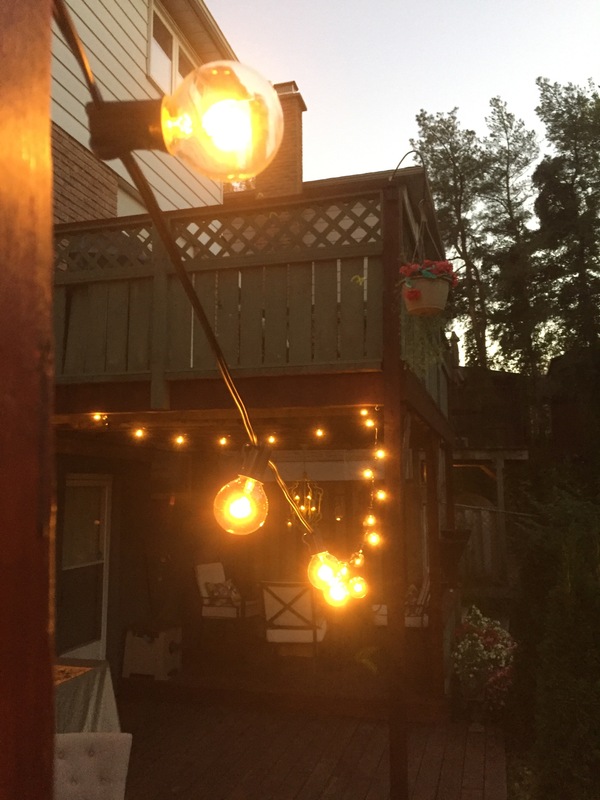 Fun was had by all as we enjoyed the company of one another under the warm glow of these spectacular porch lights. For my friends who will be celebrating Thanksgiving this week, I wish you all the best as you give thanks, break bread and feast with loved ones. Click on the link below to be connected to my Facebook page. If you haven’t already “Liked” my Facebook page, please do, and enter a Comment to be entered to win $50 to spend at the online site of ATG Stores, which is an AMAZING store. It’s a Lowes Company, and has a ton of home decor items and accessories. No purchase necessary to enter this Giveaway. To qualify, you must visit my Facebook page, hit “Like” (if you haven’t already), and leave a comment on my page. Your comment can say anything you want (as long as it’s not obscene…lol), or simply “Contest Entry”. Giveaway is open from today until Saturday, November 28th, 2015. 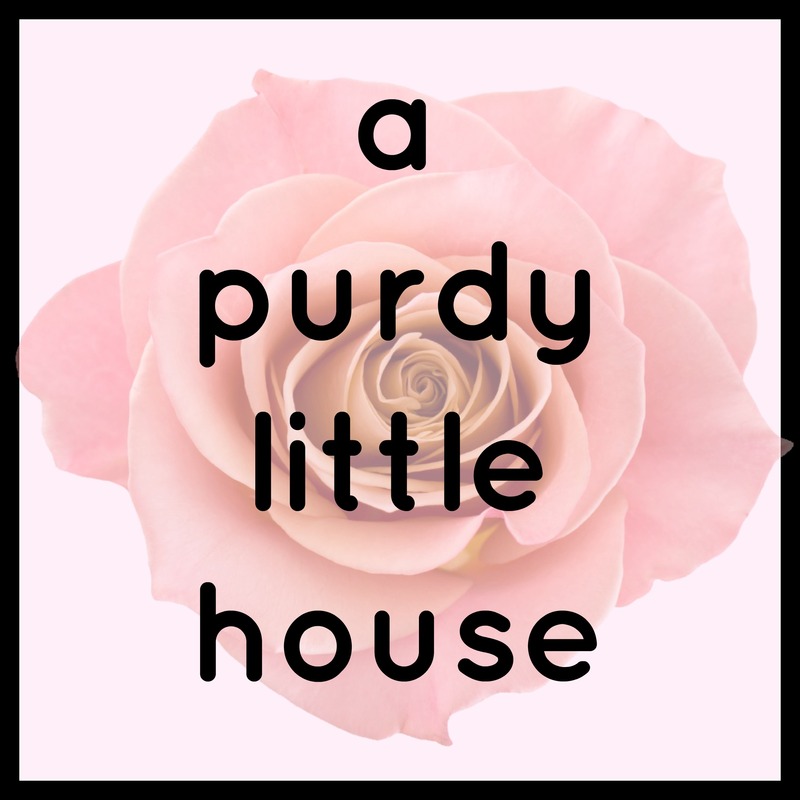 Giveaway is hosted by Porch.com and ATG Stores.com. Prize is $50.00 (USD) you can use towards the purchase of any item you like from ATG Stores.com. A code will be sent to the winner via email. Just in time for the holidays. The winner will be randomly selected (probably the old name out of a hat kind of thing). Lol… I’m actually serious. I’ll be announcing the winner on Sunday, November 29th, 2015. Thanks so much Courtney ???? I love your blog and seeing your projects come to life. Love the table! I like you on Fb. Outside sounds like the perfect way to enjoy Thanksgiving bounty.